Julian Assange: New Hillary Info Could Swing Election "If It Catches Fire"
According to Julian Assange, the next batch of information Wikileaks releases about Hillary Clinton could swing the election if it "catches fire". 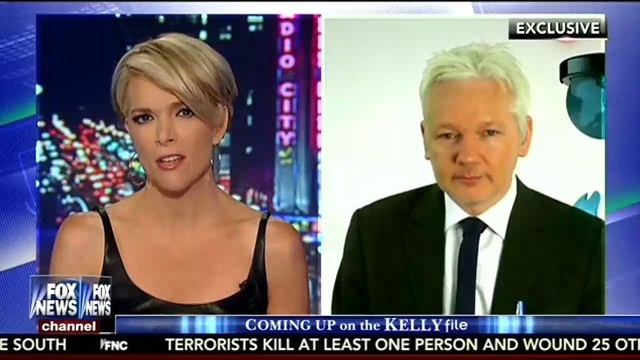 Asked by Fox News host Megyn Kelly if he thought the information in Wikileaks' possession could be a "game-changer" in the U.S. election given that Hillary is currently ahead in the polls, Assange responded in the affirmative. "I think it's significant, you know, it depends on how it catches fire in the public and in the media," he said. Elsewhere in the interview, Assange vowed that the information would be released before November 8 and that there was "thousands of pages of material" which would be released in staged batches. "People have a right to understand who it is they're electing," said Assange, adding that the information comprised of "a variety of different types of documents, from different types of institutions that are associated with the election campaign, some quite unexpected angles that are quite interesting, some even entertaining." Assange may be referring to information about Hillary Clinton's ill health, a topic which the campaign has been forced to respond to after our video went viral, attracting over 3.4 million views. Wikileaks has already begun releasing emails from Hillary's private server that suggest the presidential candidate was suffering from "decision fatigue" and sought information about a drug used to treat Parkinson's and sleepiness. Other leaks could come from the additional 14,900 emails in the possession of the FBI. On Tuesday, Wikileaks tweeted that it would be releasing some of this "bombshell" information. As we documented in a previous video, Assange appears to be concerned over his safety given the importance of the information in Wikileaks' possession. He has mentioned in previous interviews about how Hillary is kept constantly updated about his activities.